Animal manure is helpful to condition and fertilize the soil. 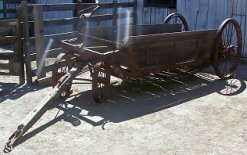 A Manure Spreader is a wagon equipped with a continuous web that carries the manure back to a beater attachment. The beater breaks up the clumps and scatters the manure evenly on the ground. In widespread use by the 1880's it was replaced by gasoline engine models in the 1930s. Manure was known to be helpful as a soil conditioner and fertilizer. It would be raked from the stalls and put into a wagon. It would then be manually be shoveled onto the fields. 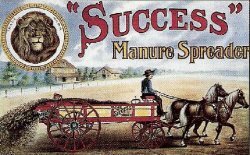 In 1875 the first successful manure spreader was invented. It was in widespread use in the 1880s. They were replaced with tractor models in the 1930s. The apron and the means of driving it constitute one of the vital parts of the spreader. The endless apron consists of an endless web passing around the front and rear shafts. The apron is supported on 2 to 3 bed rails. It is driven by the rear axel with a ratchet or worm-gear drive. The beater must spread all kinds of manure in various states of physical condition. The bars may be either of steel or wood. Teeth are firmly fastened to them. The beater may be placed above or below the apron. Above, it also acts as a pulverizer, though this puts more strain on the mechanism. The beater drive also comes from the axel via a gear and chain. A rake consisting of bars located above the beater to prevent the manure from being thrown out on clumps. It usually has large, flexible teeth. This one has a ratchet assembly attached to the rear wheel, on the right, to power the throwing wheel. The handle on the right is used to engage the throwing wheel. The left side of the throwing wheel turns a cam which pulls a bar which turns the gear which pulls the apron forward. The distance the apron is pulled forward per wheel rotation is controlled by the left handle. It moves a plate which covers some of the teeth on the gear of the apron. The more uncovered teeth, the more rotation of the apron occurs with each rotation of the throwing wheel.